While I was browsing on Very the other day my attention was grabbed by these brand new nail polishes from Nails Inc. I hadn't seen any promo for them so they took my by surprise. I searched for swatches online and grinned to myself when I saw what this one looked like on. I added it to my basket and bought it, already excited about it arriving. Here is what the wonderful 'Cornwall' nail polish looks like. The feather effect sort of reminds me of certain types of glitter nail polishes - the one's with long, slim pieces of glitter in it. The only difference is these have matte colours instead of glitter. Beaut. 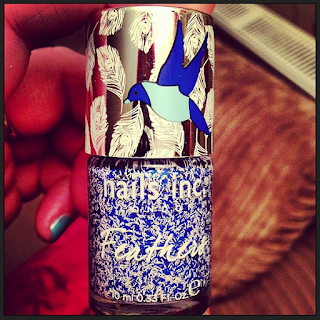 The bottle is also one of the nicest I've seen on a nail polish in a long time. It features a bird surrounded by white feathers. It looks really unique and grabs your attention straight away. 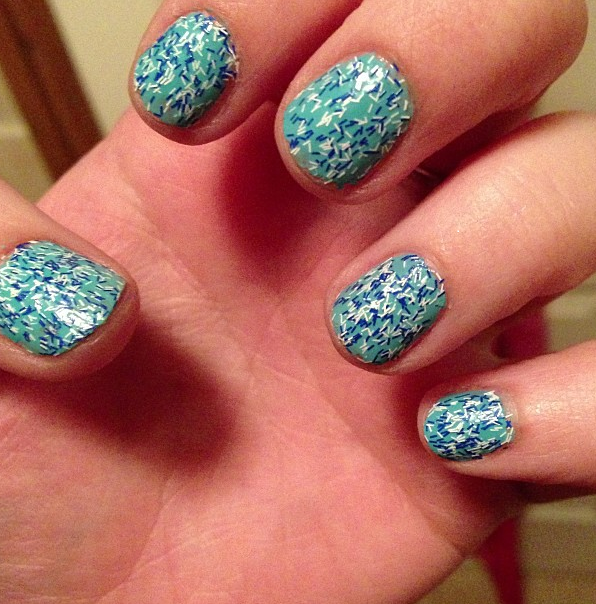 Here is what the feather effect polish looks like on the nails. I applied it over the top of Poolside Party by Headline Colors. I really love how it looks. I'm quite tempted to add a few more layers to see what it looks like. The only drawback I can see is the same issue I have with some glitter polishes and that is sometimes the pieces hang over the edge of your nail and catch on everything. It's easily sorted though so it's not a big deal. Overall, I really like this polish and will get a lot of use out of it. Today the post has been quite interesting and very Yankee Candle-y. On the left we have a small jar of Sparkling Lemon. This one if a good one, mainly because it was a freebie. If you have ever shopped on very.co.uk before you may (or may not) know about 'Treats' that they have every month. Treats are freebies that Very send you if you make an order and enter a certain code. It was a random choice of which candle they sent you and I must admit, I'm really happy with this scent! It's really fresh and light. The big candle is Bunny Cake. This is one of the Easter scents that Yankee Candle have produced for 2013. I love it's pink colouring and the scent... oh my word... It's a gorgeous coconut, vanilla cakey kind of smell. I have it burning now and it's completely filling the room. I wasn't expecting this one to be quite a strong as it is. Mmmmm. I ordered this from halfpriceyankeecandle.co.uk. I was a little nervous about ordering from this website because it seemed a little bit unprofessional, but as you pay through Paypal, I thought I could claim the money back if I paid and nothing arrived. The candle arrived in a timely fashion and well packaged too, but best of all a lot cheaper than in stores! 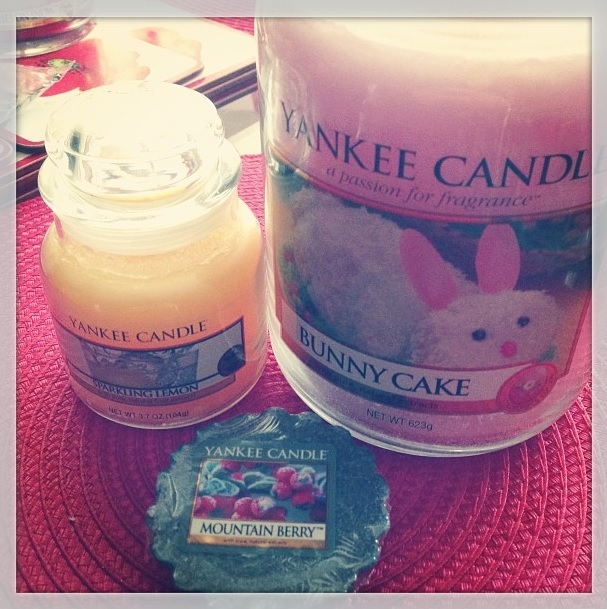 I may also have ordered the other Easter 2013 candle by Yankee called Chocolate Bunnies, which was a scent from last year too, I believe. I'll make a post once that arrives. At the bottom we have a tart called Mountain Berry which is a USA exclusive scent. I really wish we could get this one over here, because the jars cost so much money on postage! The scent it one that really appeals to me. Lovely berries and a little bit of a sweet edge to it. I managed to grab this tart from eBay for a couple of quid. Well, here we go again, I'm back to give this blog a bit of love. So, today I woke up to find that everything was white over, but everything was sunny, so surely it wouldn't be long before it all melted, right? Nah, the weather at the moment is completely all over the place and in a matter of minutes it went from sunny to blizzard conditions. After about half an hour it was back to being sunny. The weather at the moment is so weird. 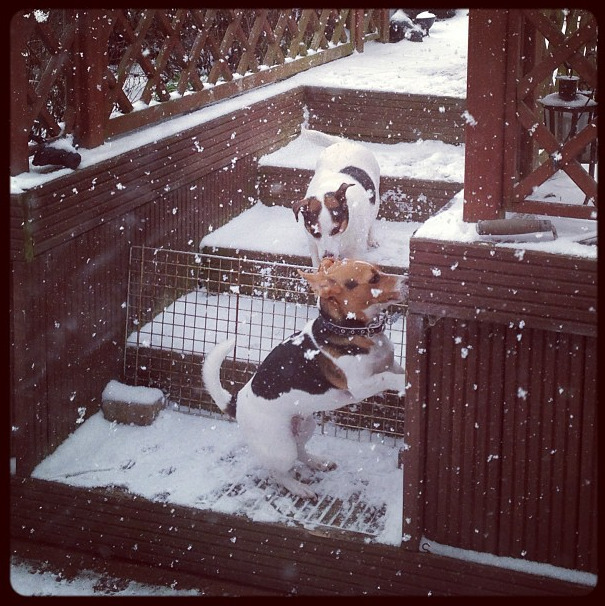 One good thing about the weather is the fact that dogs love snow. Anyway, once the snow subsided I went out to Meadowhall. I popped into Boots and spied that their Philosophy Christmas items were on sale at half price. They had a few good ones like Candy Cane and Eggnog, but I decided on Holly Berry Bubbly. This smells like a gorgeous mismash of wonderful berries. Although it's a Christmas scent, I don't think it smells that festive. I think that's why I decided on this one. The Eggnog & Candy Cane both smelt very Christmassy. I previously bought 'Have A Cherry Christmas' which was a very strong smelling sweet cherry scent. It was iridescent pink colour and is such a lovely shower gel. Holly Berry Bubbly is a bubble bath and has no iridescence to it. It looks a lot thinner in consistency than the cherry one, but I am going to give it a go as a shower gel too. We'll see how it goes! 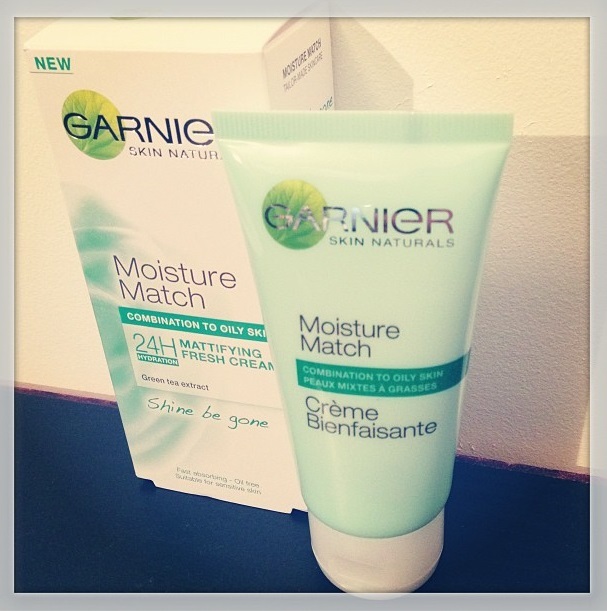 I also picked up one of the new Garnier Moisture Match moisturisers. This range caters for all skin types, whether your skin is oily, dry, dull or normal, you can find an item to suit your skin type. I went for the Mattifying Fresh Cream which is for Combination/Oily skin. My skin is a bit all over the place really. Some times it's very dry and others it's quite oily. Most of the time it's slightly oily so I went for this one. It smells really fresh and sinks into skin really nicely. We'll see how it works.